Recently, the crypto community has been reacting to a blog post from Union Square Ventures(USV) that debunks the infrastructure-first myth in technology. In their thesis, USV explains that many breakthroughs in infrastructure are driven by the evolution in applications and extrapolates some of those ideas to the Web 3.0/blockchain space. I found some of the ideas in the USV very thoughtful but also overly simplistic to the point of resulting impractical in many areas of the crypto space. Today, I would like to deep dive into the dilemma between infrastructure and applications when comes to security tokens. The infrastructure versus applications friction is one of the most important debates in the security token industry. Some of the brightest minds in the crypto-security space like Carlos Domingo, CEO of Securitize, subscribe to the thesis that sophisticated security tokens are going to be the main driver of the infrastructure in the space. Carlos’ philosophy has reflected on Securitize’s surgical focus on building components such as the integration with exchanges which have allowed them to launch several security tokens faster than the competition. Another school of thought championed by people like SpiceVC’s Ami Ben-David believe that security tokens need certain infrastructure building blocks in order to achieve any level of relevance. Others, such as Michael Oved from Fluidity have shown an incredible level of pragmatism building key infrastructure blocks such as AirSwap or the Two-Token-Waterfall Protocol while also focusing on tokenizing an apartment building in Manhattan. When comes to security tokens, determining the right level of priority between applications and infrastructure is far from being an easy and answer and I believe is highly dependent of the specific capabilities we are looking to enable with crypto-securities. I. Security tokens that are digital wrappers on existing securities or other assets. II. Security tokens that represent new forms of securities that are not existent in the current market. From an evolutionary viewpoint, you can think of group I as the result of the crypto digitization of existing securities while group II is the result of re-imagining new forms of securities that are impossible to build with the current infrastructure. Taking those two groups as a baseline, we can explain the relationship between infrastructure and applications in crypto-securities and the results are incredibly interesting. 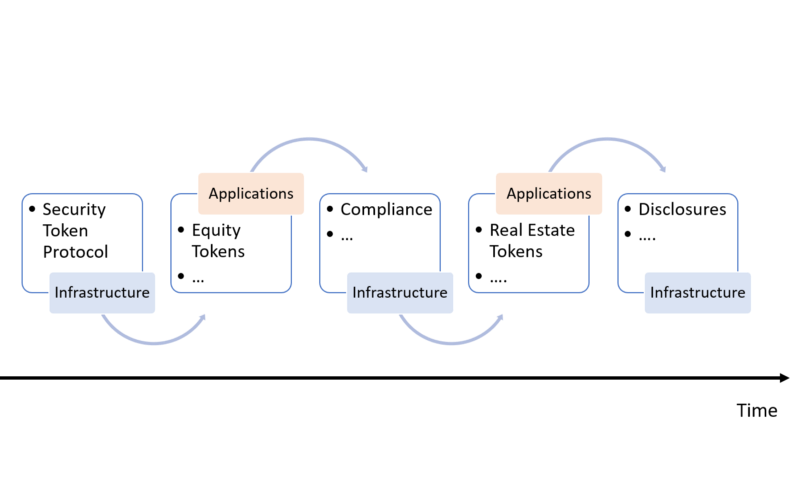 Given that security tokens in group I are tokenized representation of existing securities, they also require programmable representations of existing infrastructure building blocks in order to be operational. Compliance and disclosures are primary examples of this type of infrastructure building blocks. For a security token to be compliant with certain regulation, that regulation needs to be expressed in some on-chain form (even if is just an Oracle that interacts with off-chain data) in the token smart contract. Similarly, security tokens that are subjected to specific disclosure requirements need a disclosure infrastructure to publish public, material information that can affect the behavior of the token. For security tokens in group I to become relevant, they need some basic infrastructure protocols which can then lead to more sophisticated security tokens which will then lead to better infrastructure. 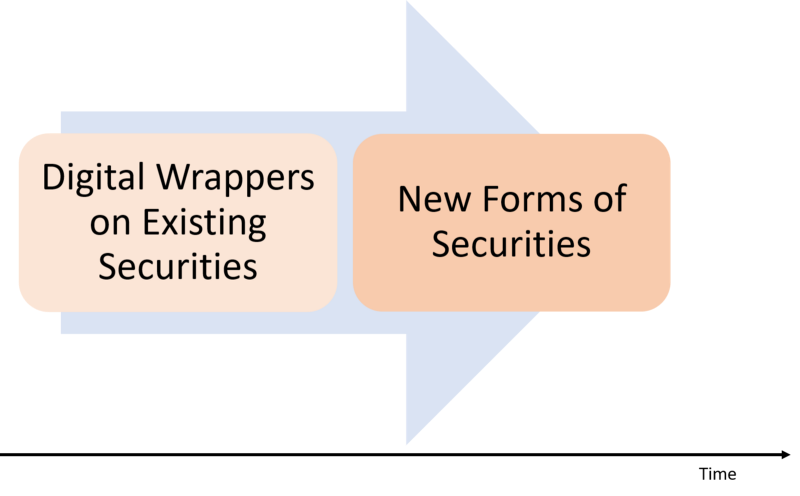 Security tokens in group II represent new forms of securities that are only possible because of the programmable capabilities of crypto-securities. A traditional security is a combination of cash-flow and voting rights. With security tokens, we can imagine new forms of securities that also represent voting rights or cash flow. New forms of derivatives, that are impossible to create with traditional financial instruments, are also likely to emerge in the security token space. We have no idea what type of infrastructure is going to be required for this type of security tokens. As a result, I believe the infrastructure for security tokens in group II will be driven mostly by the new applications in the space. In Crossing the Chasm, Geoffrey Moore presents a framework that has become one the gold standards(if we are allowed to use that phrase in crypto-land) when comes to analyze the evolution of technology markets. Among many other things, the Crossing the Chasm framework qualifies the relationship between infrastructure and applications allowing us to identify when a technology space has built enough infrastructure for applications to take off. 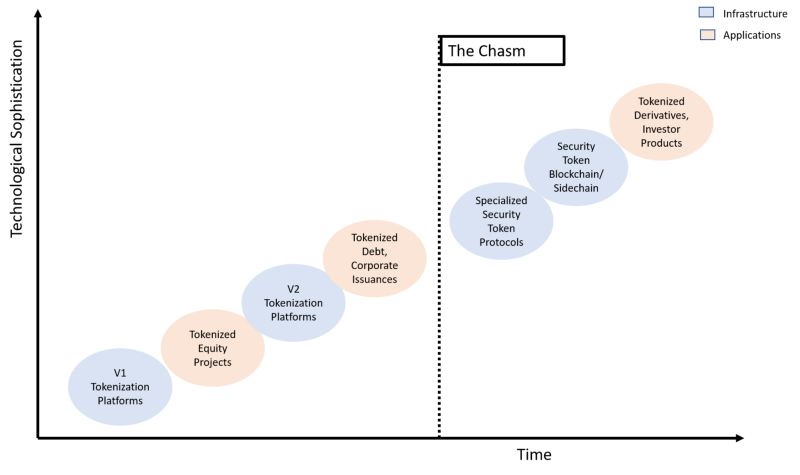 In my recent speech at the Crypto Summit in Zurich, Switzerland, I presented a chart that could help us think about the different infrastructure and application building blocks that will help the security token industry cross the chasm. The friction between applications and infrastructure is the most important dilemma in the security token space. To be as effective as existing securities, security tokens require new forms of infrastructure. That same infrastructure will enable new forms of security tokens that can barely imagine today.